Madeline Backus and P.S. Arianna at Kentucky 2017. Photo by Leslie Threlkeld. Hot off the presses! The USEF Eventing Sport Committee approved 15 riders from a pool of applicants for the 2018 Emerging Athlete Eventing 25 program. 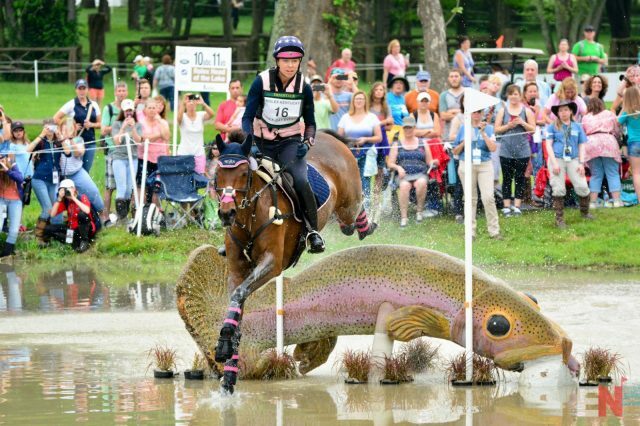 The Eventing 18 list was released in October, and we have been waiting on pins and needles for the Eventing 25 list! Talent advisors evaluated current form, competition results, and potential to make a valuable contribution in team competition when choosing the Emerging Athlete Eventing 25 program participants. They also had the option to talent spot riders onto the list who met the evaluation criteria, but did not meet the CCI2* minimum eligibility requirement, as well as invite auditing participants. “We’re looking for talented riders; we want riders that ride well and compete well and those we feel have what it takes to make the next step, whether on a current horse or one in the future,” Mike Huber, Chairman of the USEF Eventing Sport Committee and Emerging Athlete Working Group, said. USEF Eventing Emerging Athlete Coach Leslie Law will work with the Eventing 25 riders at their winter training session, January 8-11, 2018, in Ocala, Florida. The participants will gain additional skill instruction and insight through mounted and unmounted sessions. Learn more about the Emerging Athlete Eventing 25 program on the US Equestrian website. The USEF International High Performance Programs are supported by the USET Foundation, USOC, and USEF Sponsors and Members.